Recombinant Factor VIII detected with Mouse anti Human Factor VIII antibody, clone RFF-VIIIC/8 (MCA4677). 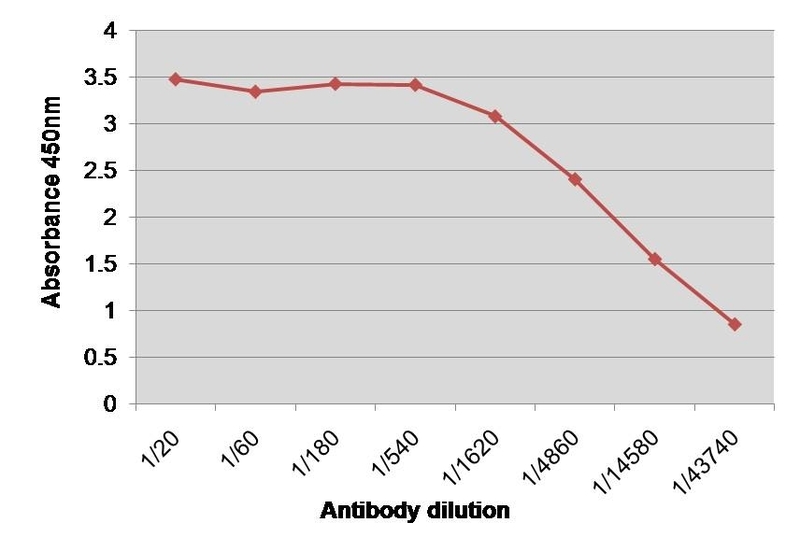 Mouse anti Humaqn Factor VIII antibody, clone RFF-VIIIC/8 (MCA4677) used in vitro to inhibit factor VIII activity. Specificity of FVIII activity assay is demonstrated by antibody inhibition and sample dilutions. 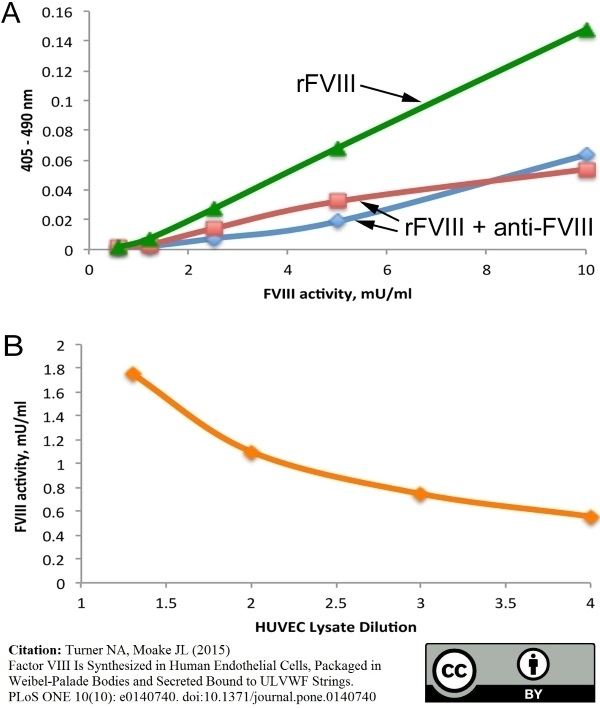 (A) FVIII activities, ranging from 0.6–10 mU/ml, in dilutions of rFVIII, were inhibited by addition of 10 μg/ml mouse anti-human FVIII antibody (clone RFF-VIIIC/8) for 10 min (on ice) prior to the start of the chromogenic Coatest assay. The green triangles represent rFVIII without antibody addition and the red squares and blue diamonds are 2 separate rFVIII dilutions with final concentrations of 10 μg/ml anti-FVIII. (B) FVIII activity was measured in HUVEC cell lysates diluted 1.3-, 2-, 3- and 4-fold in 1% BSA/PBS. From: Turner NA, Moake JL (2015) Factor VIII Is Synthesized in Human Endothelial Cells, Packaged in Weibel-Palade Bodies and Secreted Bound to ULVWF Strings. Mouse anti Human Factor VIII antibody, clone RFF-VIIIC/8 recognizes human Factor VIII, an essential blood coagulation factor. Whilst circulating in the blood, it is mostly stably complexed to von Willebrand factor. It is activated through cleavage at various sites, dissociates from the complex and interacts with Factor IXa, in the presence of calcium ions and phospholipids, to convert Factor X to the activated Factor Xa, which activates thrombin. Thrombin cleaves fibrinogen into fibrin, which polymerizes and cross-links to form a blood clot. The activated Factor VIII is proteolytically inactivated and cleared from the bloodstream. Defects in Factor VIII cause haemophilia A, a disorder characterized by the body’s inability to control blood clotting. This could result in severe blood loss, even with minor injuries. Mouse anti Human Factor VIII antibody, clone RFF-VIIIC/8 is a very potent coagulation inhibitor. It recognizes an epitope towards the N-terminus of full-length Factor VIII. It also recognizes the 210 kDa, 90 kDa and 40 kDa cleavage products. Mouse anti Human Factor VIII antibody, clone RFF-VIIIC/8 does not cross-react with von Willebrand factor. Spleen cells from an immunized Balb/c mouse we fused foth cells of the P3-NS/a-Ag4-1 mouse myeloma. Purohit, V.S. et al. (2006) Influence of aggregation on immunogenicity of recombinant human Factor VIII in hemophilia A mice. J Pharm Sci. 95 (2): 358-71. Zaniboni, A. et al. (2015) In vitro differentiation of porcine aortic vascular precursor cells to endothelial and vascular smooth muscle cells. Am J Physiol Cell Physiol. 309 (5): C320-31. Turner NA & Moake JL (2015) Factor VIII Is Synthesized in Human Endothelial Cells, Packaged in Weibel-Palade Bodies and Secreted Bound to ULVWF Strings. PLoS One. 10 (10): e0140740.